If you have a custom booking form you'd like to use for when booking a specific space, you can select it here. The questions from the selected form will be combined with those of your location and category's booking forms. Click on the space's edit () icon in the Action column. 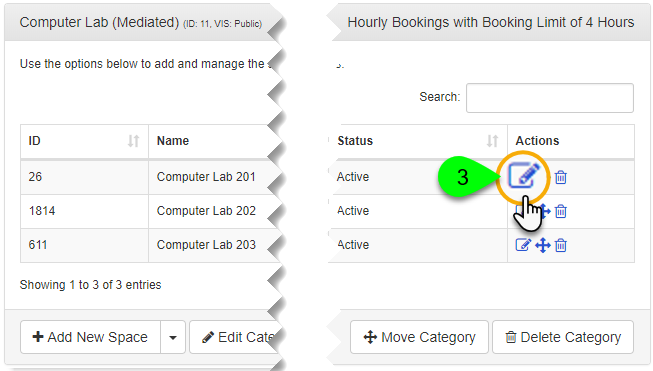 Select a booking form from the Booking Form dropdown. When a user submits a booking, they will be prompted to complete these questions along with those from the location and category's booking forms. If the same question is included in one or more forms, it will only be displayed once to the user. If you do not want to include additional booking form questions, select None (Just use Category Booking Form).